Many know him, some might not. Perhaps some of you follow his blog or have at least seen it. I remember when I heard about this Nomadic Matt guy back when I was starting out and I kept hearing about him for years without really ever interacting with him. Last summer I finally met him in person and since then, we’ve hung out a couple of times, most recently at the end of May while at the TBEX (Travel Bloggers Exchange) conference in Spain. Here’s the deal. Matt has been blogging and has been involved with travel for a long time. He’s worked on numerous projects, written books and is even working on creating a charity organization called FLYTE that will help underprivileged youth experience the benefits of travel. Travel is his life. 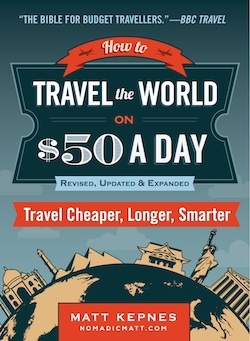 His book “How to Travel the World on $50 a Day” had its second edition released this year, and for $8 bucks on Amazon, it’s a solid investment for anyone looking to really cut costs while traveling. So, back in May at that conference, while eating some sandwiches at a food truck in Lloret de Mar, Spain (yes, they were so good that we each had to eat more than one), Matt and I got to talking and because we both focus on budget travel for the most part, we agreed to put up a little interview with him on my site. My name is Matt Kepnes and I’m known as Nomadic Matt. I’ve been traveling the world since 2006. I grew up in Boston and worked in health care after college. Fun fact: I’m also a certified high school history teacher! After a trip to Costa Rica in 2004, I fell in love with travel. I never traveled a lot growing up so I didn’t know how great it was until this trip. I loved the freedom travel enabled me to have. Every day was Saturday. The following year I took a trip to Thailand and after meeting five backpackers one day during that trip, I became very jealous of their lifestyle. But meeting them showed me that I didn’t have to be tied down to my job and that I didn’t need to be rich to travel. After that trip, I went home again, finished my MBA, quit my cubicle job, and, in July 2006, set out on an adventure around the world. My round-the-world trip was supposed to last a year but I didn’t come home until eighteen months later. Realizing I absolutely loved travel, I decided to head overseas again and that’s when I started my website, Nomadic Matt. I’ve been traveling and writing ever since. So budget travel expert…what regions of the world offer the best value? I think the best overall budget region in the world is Southeast Asia. You get amazing value for your money there. Everything is relatively inexpensive. Some other good places for budget travel: India, South Korea, Eastern Europe, and Central America. If you are budget traveler and low on funds, those would be the best places to go. Earl: Southeast Asia is great and of course, I’m a huge Eastern Europe fan too! Most new travelers over plan and mis-budget their money. When you are new to the road, you tend to plan out your route in great detail and pre-book hostels, hotels, and flights. And that makes sense. When you’re home thinking about your trip, planning it out makes it seem more real but in travel, less is more and it is far better to just go with the flow. Pick a general route but leave the details to work themselves out along the way. You’re going to change your plans when you hit the ground, I can guarantee it, and learn what you like and don’t like as you go. In addition, I’m always amazed at how often travelers run out of money. There’s so much price information online now that you can find out how much everything costs. Do a little research beforehand and get an idea of the costs you’ll face and then create your budget. Don’t go in blind. Earl: It’s definitely difficult to avoid planning when you first start out. But if you talk to as many long-term travelers as you can, I think you’ll find that almost all of them will advise against planning too much. It’s something you learn very quickly once you begin. What’s your biggest budgeting mistake that others can learn from? I make mistakes all the time but I would say my biggest mistake, one I never made twice, was not factoring in currency changes into my budget. Currencies move up and down all the time and I should have been smarter about this when I first started out with my around the world trip in 2006. I made Australia my last country on that trip and when I was doing my pre-trip budgeting, one US dollar got you 1.30 Australian dollars and I calculated my budget based on that. By the time I actually got to Australia, their dollar was on par with the US dollar. I had 30% less money because of this and, with no wiggle room in my budget, had to cut a lot of activities out of my trip. Earl: Good lesson. I now set up alerts on my phone for any countries I plan to visit in the near future in order to keep track of the exchange rates to avoid such a situation. Any memorable experience that puts a smile on your face every time you think about it? After ten years of travel, I’ve had a lot of great adventures. My days are often filled with so many activities and experiences that are definitely memorable. I would say my favorite was when I spent a month on an island in Thailand back in 2006. A small group of travelers and I spent a month on Ko Lipe, which back then was very off the beaten path. I lost my flip flops the first day I was there so just went barefoot for an entire month. I loved every day I was there and it is by far my favorite travel experience. I know it’s not a crazy story. I’ve kept my travels pretty tame but this was such a memorable time. Earl: It’s always amazing to me how being isolated on a tropical island, with very little in terms of possessions or signs of the modern world or even money, is such an enjoyable experience. Some of my own favorite experiences also involve being on remote islands. It’s proof that a simple life can certainly bring about real happiness. What’s the most frightening incident you’ve experienced while traveling? I almost drowned in Fiji. I was learning to scuba dive and on my second dive, my dive partner kicked the regulator out of my mouth. We were far under and I panicked a bit but I was able to put the regulator back in and breathe. I sat there for a while breathing in and out and calming down before I surfaced. To the credit of my instructor, he was on top of the situation very quickly and made sure I was safe. Earl: While that doesn’t sound enjoyable at all, I do like to point out that rarely does someone’s ‘worst experience’ involve something that couldn’t happen anywhere. I always stand by my belief that the world is actually much safer than we tend to believe! Any countries you don’t have a desire to visit again? Vietnam. I just didn’t like it there. I know lots of people who love it but I had a horrible time. I thought the people were abrasive, rude, and always tried to scam me and my friends. I have no desire or plan to ever go back. But that’s just my experience. I know people who hate Paris (I think they are crazy. Paris is amazing.) so I would never say don’t go somewhere. Always check it out for yourself first because we all have different experiences of course. Earl: Good thing you added that last paragraph. I wouldn’t have put this interview up if you didn’t mention that! In your book, you talk about traveling for $50 per day. That number – $50 – seems high. Why do you focus on that amount? A lot of people get stuck on that number. Depending on your point of view, it’s either too much or too little. But the first thing to remember is that it is a daily average over a year long trip and it includes pre-trip expenses such as gear and insurance as well as flights. I think when you look at it that way, the number is not so high at all. You aren’t going to spend $50 a day every day – some days will be more, most will be less and it will depend on where you are going. If you are going to Norway, $50 is a good number. If you are going to India, that’s way more than you’ll need! But more than being just a number, it’s a philosophy. The book is designed to be a guide to budget travel but it is full of real tips and tricks that are actually useful for travel on any budget. Earl: Like you said, advice on how to budget your travels can always apply to anyone. We are always looking to save money, no matter how much we can afford or want to spend. If I can travel to a country and spend $800 for a month, I’d of course also be interested in learning how to have the same experience for $600 if possible. What is the simplest method you know for travelers to save money? I think the best thing people can do to save money when they travel is to be flexible. The difference of a day can mean the difference of hundreds of dollars. When you are flexible with time and place, you can capture the best deals that come up. For most people, they can’t be flexible on both so be flexible on at least one because if you have to go to Paris on a certain day, you are paying whatever the listed price is. There’s no magic bullet in travel and there are only so many ways to lower expenses. Sometimes the price is the price. So I recommend people be flexible when they can. If you’re dead set on Paris, go when it is cheapest. If you can only travel during two weeks in June, go to where it is cheapest. This approach can really save a ton of money in the end. Earl: This is exactly what I would have said too and I think many long-term travelers agree with this. The more you plan, the more you’re stuck in those plans, and when a different experience or better deal pops up, you’re not able to take advantage of it. It’s okay to plan a little but as you travel, I think most people realize just how important being flexible truly can be. When it comes to saving money on travel, what’s the biggest difference between when you started and today? It’s a lot easier to find good deals today. When I started, information was scarce. Now, there are so many blogs, deal-finding websites and travel apps, that travel has never been easier or more accessible. When I started researching my first trip back in 2006, I remember finding one website on backpacking Europe that helped me plan my trip. Now, there are hundreds of websites about every country in Europe that can help plan your trip. Before, if you wanted to find a good flight deal, you would have to spend hours searching routes and carriers. Now, there are websites like holidaypirates.com, theflightdeal.com and airfarewatchdog.com that alert you about deals. They have teams of people doing all the work so you don’t have to do anything but see what deals exist every day. It’s really never been a better time to travel because of all these deals and all of the information that you can find so easily, all of which will help you save money in ways that travelers couldn’t before. Earl: Ever since I signed up for theflightdeal.com, I’ve wanted to book flights almost every week. For those living in the US, there are some unbelievable deals out there that you probably won’t hear about without an alert from this website. A good example from the alert email I received today: $555 USD roundtrip from Chicago to St. Petersburg, Russia. Who’s coming with me? Any other money-saving tips you’ve picked up on your own travels? 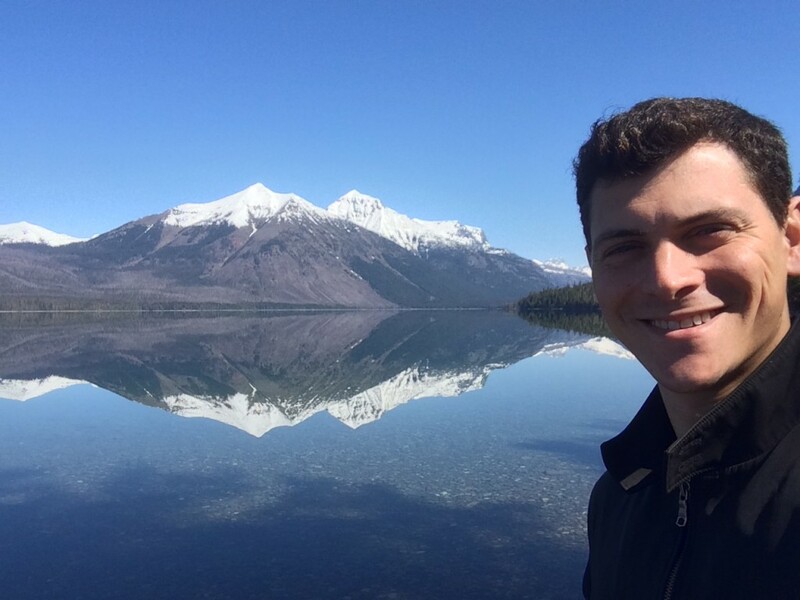 Any questions for Matt or about saving money while wandering the world? I think one of the biggest financial mistakes you can make, while travelling, is not getting the right cards and bank account before you go. When I left for my three year (!) trip, I left in a bit of a hurry and a flap as my relationship had just ended. I didn’t have time to sort all this kinda thing out. I ended up paying a lot of money that first year on bank fees. I’d totally recommend getting all this sort of thing sorted before you go, so you’re not bartering here, but then spending loads of money over there. 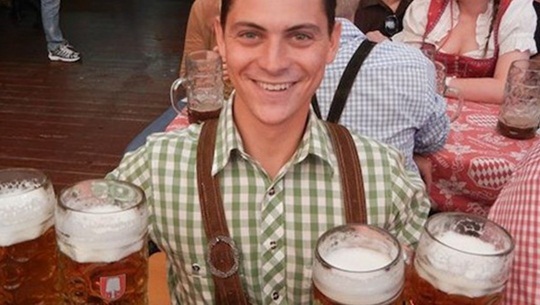 I actually stumbled upon your blog because I came your blog on Nomadic Matt. I was shocked about Vietnam because everybody seems to be loving it but as Matt said it all depends on individual experience. Im not a great planner/organiser when it comes to travel and I tend to go with the flow because every time I organise it just doesn’t work out for me. Love the “not over planning” advice. My best trip to date was a two week jaunt around Belize with my best friend using this method. Using this technique allowed us to get a personalized tour of Chan Chich Lodge, bar hopping in San Ignacio with Belize’s Chief of Police, catching the first game of the Belize Premier League Championships, and staying overnight in a Mayan Village about 45 minutes Northeast of Punta Gorda. None of this would happened had we stuck to a strict itinerary! Definitely “go with the flow” if you can, especially in less visited countries. You never know the opportunities that may arise coming from this! Hi Earl! Have you ever been in Peru? Hey Fernanda – I haven’t been to Peru yet. Hey Earl- great interview. I definitely agree with you and Matt. I was flexible with my travel plan in the balkan region/Europe. I used different flight path destinations in Europe and ended up saving loads of money in airline fee. Good advice! Figure out what means the most to you and spend liberally in that area … in the areas that don’t matter as much, find every way possible to save money. Matt is a great guy. I often read his articles and he presents some great information. His blog helped me a lot during my travels! Hey Earl, a buddy and I are currently traveling the US. We packed up a few items and just headed out with rough plans. I started in Colorado and he started doing the John Muir trail. Now we have made our way to the Northeast, went through as much as we could and are working at a winery in Maine. We plan on continuing our trip overseas next year, maybe sooner. Any advice about some unknowns we may run into? We plan on doing France first, not sure where. Thanks! Hey Jon – There will be plenty of unknowns out there but it’s different for everyone…you just need to start the adventure and see where it leads! At the end of the day, if you managed this US trip of yours, you’ll have no problem overseas as well. Hey Earl, very cool you got to hang out with another fellow travel enthusiast and blogger. One question, did you ever worry about just picking up and leaving? I would love to travel more, but I’m also afraid of leaving behind a steady job and not saving money for things like retirement. Did it ever feel like you weren’t being responsible? And not having benefits? Were these things ever a concern for you? I want to see the world so badly, but this concern is always in the back of my mind. Hey Megan – Well, for me, I never really had that steady job before I left. I went overseas on a post-graduation trip and the plan was to go home after 3 months and begin my career. But I never went home in the end. So it really comes down to making a personal decision as to what you are looking for in life and what path will be the most fulfilling for you. And just because you travel, doesn’t mean you aren’t saving money for retirement. I am definitely saving money for retirement. I save money every single month and I pay for health insurance as well. So it’s not much different than if I was working at home somewhere. Agree on Central America being cheap, although I got a bit stung in Costa Rica last year! I’m dying to see Asia so will definitely start south east and work my way around. It’s nice to see you both still have your love of travel. I only really discovered mine in the last few years, but it has taken over my life! I’ve loved blogging my way around some weird and wonderful parts of the world! What a nice surprise for a interview since I know many of us read both your blogs all the time. Awesome!! First of all I been following earl since long time and all blog r very inspiring. Thank u for all this. I have one question, what u guys do for accomadation?? How u find it in other countries??? Hey Veel – Thanks for commenting and for following the site! For accommodation, I generally use a combination of hostelworld.com, airbnb.com and then getting recommendations from other travelers/bloggers that I find online. But for budget travel, hostelworld.com is the way to go. They list hostels and other budget accommodation in just about every town and city on the planet it seems! Airbnb is great, but Hostelworld isn’t as great as you make it sound. A lot of hostels no longer use it because they keep on raising their booking fees since they got bought by a big investment company, and you often pay more if you book through them. Hostelz.com is a bigger and better free hostel listing service that really does list all hostels in every town. He said that because he had bad experiences and he’s not the first one I hear saying that about Vietnam… in some places it seems like your a walking ATM. That and also the fact he is american maybe doesn’t help (not sure about how french people are perceived in Vietnam). Interesting interview! I’ve been following you both for a long time now so good to see what similarities you both have about your travel. I was at TBEX in Spain as well and remember those food trucks! We also spent a LOT of time chatting around those. Great memories! Not factoring currency exchanges was indeed my biggest travel mistake so far. It’s impressive how much it can fly away from your hands in commissions, fees, etc! Quite surprised to see Vietnam as a disappointing experience for Matt, I can’t wait to go there! You are the two bloggers that have been inspiring to me the most, both as traveller and a travel blogger. Keep up the great work! Lol, I feel a bit sad when I saw “….best overall budget region in the world is Southeast Asia”. There are a lot of cheap tickets from UK to Asia but not the other way round now. If I follow a 10 nights tour package, it would cost me at least USD3,500.00 for a short trip and I dislike timed-tour. I have had bad experiences in many developing countries. Ukraine I had people begging me on the train from Simferopol to Odessa, all they could say in English was “give me money” constantly…weren’t aggressive just annoying. I got overcharged big time in Bangkok going from one bus terminal to another, I asked how much? Driver said 100, I clarified in writing on my mobile and when got to other teimal he said 1000baht and tried to get another two cabbies on me to give him the amount he wanted…cons everywhere. I got a guy in the street of Suva Fiji trying to trick me into buying an ornament by asking me my name then he started to engrave it but straight away I knew what was happening and walked away. I also had a bad experience in omotepe Nicaragua where the owner of a hotel served me and fellow travellers dinner, I paid mine and he mysteriously forgot to give me the $30 equivalent change and was difficult about giving it back saying i hadn’t paid him as much as I had…raaaaa!!! And the worst of all is when I came from panama to Costa Rica and crossed the border by foot but the costa ricabcustoms official said i needed an onwards ticket as proof i was leaving the country, but I had an airline ticket from mexico to uk only a month later which wasnt outside the valid time I could stay there as uk nationals can stay for up to 90 days. I protested and he got some handcuffs and started making calls and threatened to get police to interrogate me…so I ended up getting the tika bus that he said i had to get for 25$ and everything was fine after that…definitely some dodgy business going on with the tika bus company and the border officials. When I entered from Nicaragua there was no problem what so ever…no onwards proof required! We travel in Central America a lot and have learned about the problem with making change. We go to our bank in December and stock up on new American bills especially small denominations. I bring 200 $1 bills, great for tips and for making the right change. I also bring $5 and $10 bills. You are far better off to give the correct amount of money rather than wait for change. A lot of people will try to cheat you on change. Sometimes it is not getting cheated but convenience, give a big bill and the waitress has to go across the street to the bank to get change! While you wait. Bring lots of small bills and all this becomes a very minor inconvenience, just part of the “never a dull moment” vibe of these places. I am following your blog for long time. I am yet to work up the courage to travel alone. I am from India and I have just started to visit different places in my country. Most of the times I am cancelling my plans because being a women I am worried about travelling alone and all the risks that accompanies with it. I want to travel lot and can you give few tips to us girls on how to be a safe while travelling. Also can you recommend few places that I can visit with minimal budget from India. I noticed your reply. While I cannot help with the cheap destinations from India (I’ll let Earl or Matt tackle that for you), I am a solo female traveller. Over the years I’ve done various trips on my own and now I’m traveling for 5 months from Milan to Bangkok – my wok in the US also requires that I travel the country quite extensively, often on my own. – Take the normal precautions you would at home – for me, that means I don’t walk down dark alleys by myself, for example. This also means I would never smoke a pipe with a group of men by myself (sorry Earl, that story was fascinating, but as a female, not a situation I would ever get myself into). – I make sure that my lodging is close to other places or if it’s not, there are other travelers staying there. Fellow travelers are your friends, even if you don’t end up being that social, if you pick a place with lots of them, you’ll be fine. – Trust your instinct – my gut never fails me. I get a sense of a situation or a person pretty quickly. If I feel something is up, I move on…simple as that. But, I can’t emphasize this enough, the world is not as scary for women as others make it out to be. I hope you do make some plans for a solo trip – even just a weekend out of town, it can be quite liberating. Hey Hyma – Thanks for writing. First, you’ll have to check online to see which countries you can visit without a visa and then you can see which ones are the least expensive to visit and travel around. As for females traveling, the world is much safer than we imagine and if you ask solo female travelers who have been traveling for a long time, they will always say that common sense is what keeps them safe. If they use the same common sense they would use at home, the chance of anything happening while traveling is about the same…very low. Great interview. I’ve traveled with Earl, know Anil from Foxnomad and have bought Matt’s book which I found vert helpful. All three of you are great inspirations to all would be and current travelers. Many thanks for all the useful information. I really have noticed the common thread of “not over planning”. Sounds good to me! Hey Dan – Thanks for commenting here. As you can tell even with my tour, over planning is not something I like to do at all! Keep it simple, see how things turn out and go from there…much better idea to me. Hope you’re well as always! Great advice in here, especially about the changing currencies, the flexibility options (where you go or when you go), and all of the sites for finding cheap flights. Earl, you said you get alerts when currencies change; what app or site do you use for this? Hey Gillian – I just have the standard currency app built in to my android phone. I have a screen that has a few currencies listed and is constantly being updated. But I know many people use the xe.com app. Always go with the flow. Truly makes you stress free in all the planning and making things perfect. I always put in mind too that to expect the unexpected 🙂 I always take it as a challenge. It is truly an inspiring interview, both you and Matt are just two awesome individual that I followed to get me more motivated for my travel dream. To each their own. I’ve been to Paris twice and both times the people were very helpful and very nice. London on the other hand … I think the nicest people I’ve encountered traveling (and I haven’t been to a lot of places) were in Turkey. That’s my favorite place so far. I also want to say that I agree about being flexible. I am going in my third trip and I’m just figuring this out so its funny to read it. Good interview. Count me in on those who do not like Paris, well…Parisians…I find them abrasive, rude, etc. The city is beautiful. Also was surprised about Vietnam, as I have heard different stories. Thank you Earl and Matt for your advice and insights! Had the same issue about currencies, between the Euro and the UAE Dirham (where I live now), making me almost ending up in court (No one jokes about bouncing cheques here!). Still very curious about Vietnam, surprised about what you said as everyone seem to love it. Question: you’ve been on the road for 10 years almost, any plans of settling down? Also, I really have issues budgeting and sticking to it, any recommendations in terms of methods/apps? Thanks and happy travels to both of you!